Establishing genomic resources for closely related species will provide comparative insights that are crucial for understanding diversity and variability at multiple levels of biological organization. We developed ESTs for Mexican axolotl (Ambystoma mexicanum) and Eastern tiger salamander (A. tigrinum tigrinum), species with deep and diverse research histories. Approximately 40,000 quality cDNA sequences were isolated for these species from various tissues, including regenerating limb and tail. These sequences and an existing set of 16,030 cDNA sequences for A. mexicanum were processed to yield 35,413 and 20,599 high quality ESTs for A. mexicanum and A. t. tigrinum, respectively. Because the A. t. tigrinum ESTs were obtained primarily from a normalized library, an approximately equal number of contigs were obtained for each species, with 21,091 unique contigs identified overall. The 10,592 contigs that showed significant similarity to sequences from the human RefSeq database reflected a diverse array of molecular functions and biological processes, with many corresponding to genes expressed during spinal cord injury in rat and fin regeneration in zebrafish. To demonstrate the utility of these EST resources, we searched databases to identify probes for regeneration research, characterized intra- and interspecific nucleotide polymorphism, saturated a human – Ambystoma synteny group with marker loci, and extended PCR primer sets designed for A. mexicanum / A. t. tigrinum orthologues to a related tiger salamander species. Our study highlights the value of developing resources in traditional model systems where the likelihood of information transfer to multiple, closely related taxa is high, thus simultaneously enabling both laboratory and natural history research. Establishing genomic resources for closely related species will provide comparative insights that are crucial for understanding diversity and variability at multiple levels of biological organization. Expressed sequence tags (EST) are particularly useful genomic resources because they enable multiple lines of research and can be generated for any organism: ESTs allow the identification of molecular probes for developmental studies, provide clones for DNA microchip construction, reveal candidate genes for mutant phenotypes, and facilitate studies of genome structure and evolution. Furthermore, ESTs provide raw material from which strain-specific polymorphisms can be identified for use in population and quantitative genetic analyses. The utility of such resources can be tailored to target novel characteristics of organisms when ESTs are isolated from cell types and tissues that are actively being used by a particular research community, so as to bias the collection of sequences towards genes of special interest. Finally, EST resources produced for model organisms can greatly facilitate comparative and evolutionary studies when their uses are extended to other, closely related taxa. Salamanders (urodele amphibians) are traditional model organisms whose popularity was unsurpassed early in the 20th century. At their pinnacle, salamanders were the primary model for early vertebrate development. Embryological studies in particular revealed many basic mechanisms of development, including organizer and inducer regions of developing embryos . Salamanders continue to be important vertebrate model organisms for regeneration because they have by far the greatest capacity to regenerate complex body parts in the adult phase. In contrast to mammals, which are not able to regenerate entire structures or organ systems upon injury or amputation, adult salamanders regenerate their limbs, tail, lens, retina, spinal cord, heart musculature, and jaw [2–7]. In addition, salamanders are the model of choice in a diversity of areas, including vision, embryogenesis, heart development, olfaction, chromosome structure, evolution, ecology, science education, and conservation biology [8–15]. All of these disciplines are in need of genomic resources as fewer than 4100 salamander nucleotide sequences had been deposited in GenBank as of 3/10/04. Here we describe results from an EST project for two ambystomatid salamanders: the Mexican axolotl, Ambystoma mexicanum and the eastern tiger salamander, A. tigrinum tigrinum. These two species are members of the Tiger Salamander Complex , a group of closely related species and subspecies that are widely distributed in North America. Phylogenetic reconstruction suggests that these species probably arose from a common ancestor about 10–15 million years ago . Ambystoma mexicanum has a long research history of over 100 years and is now principally supplied to the research community by the Axolotl Colony , while A. t. tigrinum is obtained from natural populations in the eastern United States. Although closely related with equally large genomes (32 × 109 bp), these two species and others of the Complex differ dramatically in life history: A. mexicanum is a paedomorphic species that retains many larval features and lives in water throughout it's life cycle while A. t. tigrinum undergoes a metamorphosis that is typical of many amphibians. Like many other traditional model organisms of the last century, interest in these two species declined during the rise of genetic models like the fly, zebrafish, and mouse . However, "early" model organisms such as salamanders are beginning to re-attract attention as genome resources can rapidly be developed to exploit the unique features that originally identified their utility for research. We make this point below by showing how the development of ESTs for these two species is enabling research in several areas. Furthermore, we emphasize the value of developing resources in model systems where the likelihood of information transfer to multiple, closely related taxa is high, thus simultaneously enabling both laboratory and natural history research programs. Eleven cDNA libraries were constructed using a variety of tissues (Table 1). Pilot sequencing of randomly selected clones revealed that the majority of the non-normalized libraries were moderate to highly redundant for relatively few transcripts. For example, hemoglobin-like transcripts represented 15–25% of the sampled clones from cDNA libraries V1, V2, and V6. Accordingly, we chose to focus our sequencing efforts on the non-normalized MATH library as well as the normalized AG library, which had lower levels of redundancy (5.5 and 0.25% globins, respectively). By concentrating our sequencing efforts on these two libraries we obtained transcripts deriving primarily from regenerating larval tissues in A. mexicanum and several non-regenerating larval tissues in A. t. tigrinum. Tissues selected to make cDNA libraries. Further information is found in Methods and Materials. A total of 46,064 cDNA clones were sequenced, yielding 39,982 high quality sequences for A. mexicanum and A. t. tigrinum (Table 2). Of these, 3,745 corresponded to mtDNA and were removed from the dataset; complete mtDNA genome data for these and other ambystomatid species will be reported elsewhere. The remaining nuclear ESTs for each species were clustered and assembled separately. We included in our A. mexicanum assembly an additional 16,030 high quality ESTs that were generated recently for regenerating tail and neurula stage embryos . Thus, a total of 32,891 and 19,376 ESTs were clustered for A. mexicanum and A. t. tigrinum, respectively. Using PaCE clustering and CAP3 assembly, a similar number of EST clusters and contigs were identified for each species (Table 2). Overall contig totals were 11,190 and 9,901 for A. mexicanum and A. t. tigrinum respectively. Thus, although 13,515 more A. mexicanum ESTs were assembled, a roughly equivalent number of contigs were obtained for both species. This indicates that EST development was more efficient for A. t. tigrinum, presumably because ESTs were obtained primarily from the normalized AG library; indeed, there were approximately twice as many ESTs on average per A. mexicanum contig (Table 2). Thus, our EST project yielded an approximately equivalent number of contigs for A. mexicanum and A. t. tigrinum, and overall we identified > 21,000 different contigs. Assuming that 20% of the contigs correspond to redundant loci, which has been found generally in large EST projects , we identified transcripts for approximately 17,000 different ambystomatid loci. If ambystomatid salamanders have approximately the same number of loci as other vertebrates (e.g. ), we have isolated roughly half the expected number of genes in the genome. EST summary and assembly results. aIncludes 16,030 ESTs from . We searched all contigs against several vertebrate databases to identify sequences that exhibited significant sequence similarity. As our objective was to reliably annotate as many contigs as possible, we first searched against 19,804 sequences in the NCBI human RefSeq database (Figure 1), which is actively reviewed and curated by biologists. This search revealed 5619 and 4973 "best hit" matches for the A. mexicanum and A. t. tigrinum EST datasets at a BLASTX threshold of E = 10-7. The majority of contigs were supported at more stringent E-value thresholds (Table 3). Non-matching contigs were subsequently searched against the Non-Redundant (nr) Protein database and Xenopus tropicalus and X. laevis UNIGENE ESTs (Figure 1). These later two searches yielded a few hundred more 'best hit' matches, however a relatively large number of ESTs from both ambystomatid species were not similar to any sequences from the databases above. Presumably, these non-matching sequences were obtained from the non-coding regions of transcripts or they contain protein-coding sequences that are novel to salamander. Although the majority are probably of the former type, we did identify 3,273 sequences from the non-matching set that had open reading frames (ORFs) of at least 200 bp, and 911 of these were greater than 300 bp. Results of BLASTX and TBLASTX searches to identify best BLAST hits for Ambystoma contigs searched against NCBI human RefSeq, nr, and Xenopus Unigene databases. Ambystoma contig search of NCBI human RefSeq, nr, and Xenopus Unigene databases. The distribution of ESTs among contigs can provide perspective on gene expression when clones are randomly sequenced from non-normalized cDNA libraries. In general, frequently sampled transcripts may be expressed at higher levels. We identified the 20 contigs from A. mexicanum and A. t. tigrinum that contained the most assembled ESTs (Table 4). 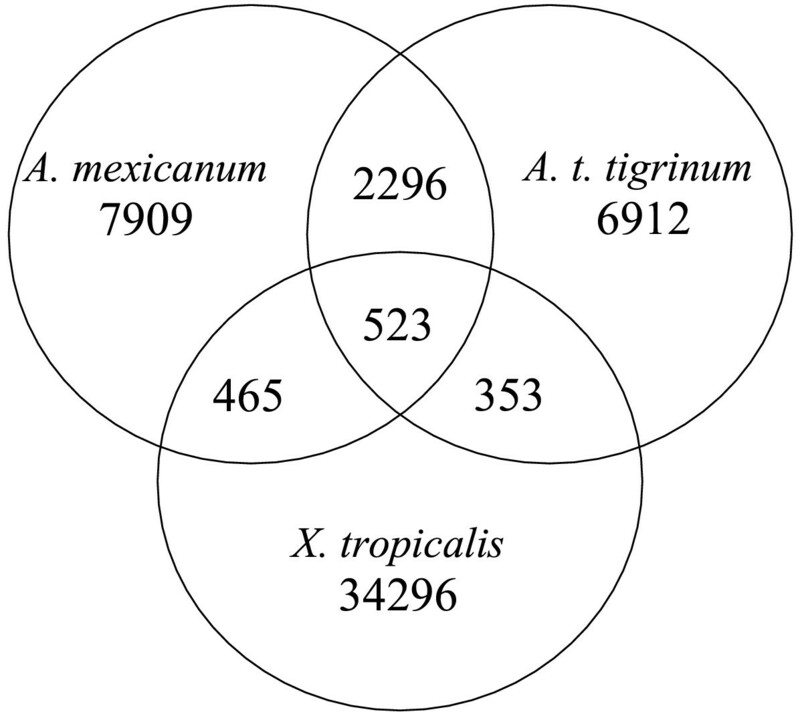 The largest A. t. tigrinum contigs contained fewer ESTs than the largest A. mexicanum contigs, probably because fewer overall A. t. tigrinum clones were sequenced, with the majority selected from a normalized library. However, we note that the contig with the most ESTs was identified for A. t. tigrinum: delta globin. In both species, transcripts corresponding to globin genes were sampled more frequently than all other loci. This may reflect the fact that amphibians, unlike mammals, have nucleated red blood cells that are transcriptionally active. In addition to globin transcripts, a few other house-keeping genes were identified in common from both species, however the majority of the contigs were unique to each list. Overall, the strategy of sequencing cDNAs from a diverse collection of tissues (from normalized and non-normalized libraries) yielded different sets of highly redundant contigs. Only 25% and 28% of the A. mexicanum and A. t. tigrinum contigs, respectively, were identified in common (Figure 2). We also note that several hundred contigs were identified in common between Xenopus and Ambystoma; this will help facilitate comparative studies among these amphibian models. Top 20 contigs with the most assembled ESTs. For the 10,592 contigs that showed significant similarity to sequences from the human RefSeq database, we obtained Gene Ontology (23) information to describe ESTs in functional terms. Although there are hundreds of possible annotations, we chose a list of descriptors for molecular and biological processes that we believe are of interest for research programs currently utilizing salamanders as model organisms (Table 5). In all searches, we counted each match between a contig and a RefSeq sequence as identifying a different ambystomatid gene, even when different contigs matched the same RefSeq reference. In almost all cases, approximately the same number of matches was found per functional descriptor for both species. This was not simply because the same loci were being identified for both species, as only 20% of the total number of searched contigs shared sufficient identity (BLASTN; E< 10-80 or E< 10-20) to be potential homologues. In this sense, the sequencing effort between these two species was complementary in yielding a more diverse collection of ESTs that were highly similar to human gene sequences. Numbers in parentheses reference GO numbers . The value of a salamander model to regeneration research will ultimately rest on the ease in which data and results can be cross-referenced to other vertebrate models. For example, differences in the ability of mammals and salamanders to regenerate spinal cord may reflect differences in the way cells of the ependymal layer respond to injury. As is observed in salamanders, ependymal cells in adult mammals also proliferate and differentiate after spinal cord injury (SCI) [24, 25]; immediately after contusion injury in adult rat, ependymal cell numbers increase and proliferation continues for at least 4 days [; but see ]. Rat ependymal cells share some of the same gene expression and protein properties of embryonic stem cells , however no new neurons have been observed to derive from these cells in vivo after SCI . Thus, although endogenous neural progenitors of the ependymal layer may have latent regenerative potential in adult mammals, this potential is not realized. Several recently completed microarray analyses of spinal cord injury in rat now make it possible to cross-reference information between amphibians and mammals. For example, we searched the complete list of significantly up and down regulated genes from Carmel et al. and Song et al. against all Ambystoma ESTs. Based upon amino acid sequence similarity of translated ESTs (TBLASTX; E<10-7), we identified DNA sequences corresponding to 69 of these 164 SCI rat genes (Table 6). It is likely that we have sequence corresponding to other presumptive orthologues from this list as many of our ESTs only contain a portion of the coding sequence or the untranslated regions (UTR), and in many cases our searches identified closely related gene family members. Thus, many of the genes that show interesting expression patterns after SCI in rat can now be examined in salamander. Ambystoma contigs that show sequence similarity to rat spinal cord injury genes. gi|1552375| SKR6 gene, a CB1 cannabinoid recept. gi|436934| Sprague Dawley protein kinase C rec. gi|951175| limbic system-associated membrane prot. Similar gene expression programs may underlie regeneration of vertebrate appendages such as fish fins and tetrapod limbs. Regeneration could depend on reiterative expression of genes that function in patterning, morphogenesis, and metabolism during normal development and homeostasis. Or, regeneration could depend in part on novel genes that function exclusively in this process. We investigated these alternatives by searching A. mexicanum limb regeneration ESTs against UNIGENE zebrafish fin regeneration ESTs (Figure 3). 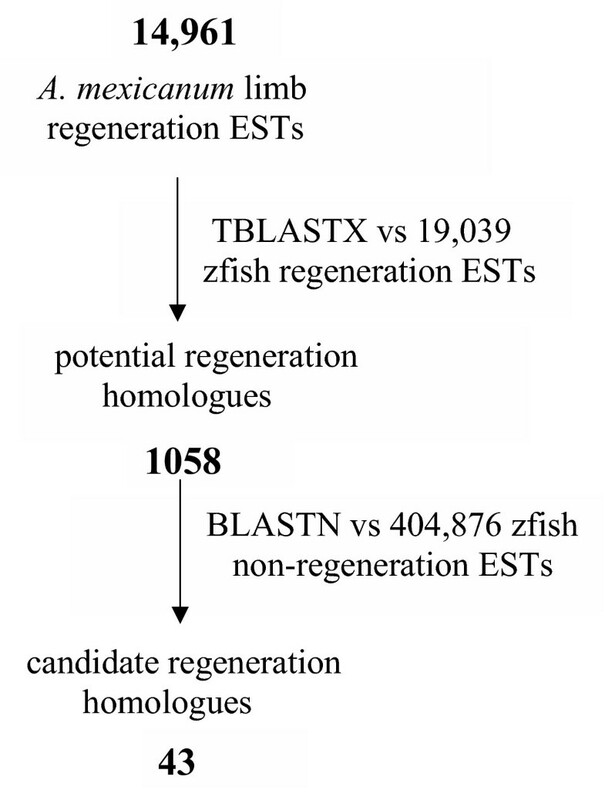 This search identified 1357 significant BLAST hits (TBLASTX; E<10-7) that corresponded to 1058 unique zebrafish ESTs. We then asked whether any of these potential regeneration homologues were represented uniquely in limb and fin regeneration databases (and not in databases derived from other zebrafish tissues). A search of the 1058 zebrafish ESTs against > 400,000 zebrafish ESTs that were sampled from non-regenerating tissues revealed 43 that were unique to the zebrafish regeneration database (Table 7). Conceivably, these 43 ESTs may represent transcripts important to appendage regeneration. For example, our search identified several genes (e.g. hspc128, pre-B-cell colony enhancing factor 1, galectin 4, galectin 8) that may be expressed in progenitor cells that proliferate and differentiate during appendage regeneration. Overall, our results suggest that regeneration is achieved largely through the reiterative expression of genes having additional functions in other developmental contexts, however a small number of genes may be expressed uniquely during appendage regeneration. Results of BLASTN and TBLASTX searches to identify best BLAST hits for A. mexicanum regeneration ESTs searched against zebrafish EST databases. A total of 14,961 A. mexicanum limb regeneration ESTs were assembled into 4485 contigs for this search. Human RefSeq sequence ID's are provided to allow cross-referencing. The identification of single nucleotide polymorphisms (SNPs) within and between orthologous sequences of A. mexicanum and A. t. tigrinum is needed to develop DNA markers for genome mapping , quantitative genetic analysis , and population genetics . We estimated within species polymorphism for both species by calculating the frequency of SNPs among ESTs within the 20 largest contigs (Table 4). These analyses considered a total of 30,638 base positions for A. mexicanum and 18,765 base positions for A. t. tigrinum. Two classes of polymorphism were considered in this analysis: those occurring at moderate (identified in 10–30% of the EST sequences) and high frequencies (identified in at least 30% of the EST sequences). Within the A. mexicanum contigs, 0.49% and 0.06% of positions were polymorphic at moderate and high frequency, while higher levels of polymorphism were observed for A. t. tigrinum (1.41% and 0.20%). Higher levels of polymorphism are expected for A. t. tigrinum because they exist in larger, out-bred populations in nature. To identify SNPs between species, we had to first identify presumptive, interspecific orthologues. We did this by performing BLASTN searches between the A. mexicanum and A. t. tigrinum assemblies, and the resulting alignments were filtered to retain only those alignments between sequences that were one another's reciprocal best BLAST hit. As expected, the number of reciprocal 'best hits' varied depending upon the E value threshold, although increasing the E threshold by several orders of magnitude had a disproportionately small effect on the overall total length of BLAST alignments. A threshold of E< 10-80yielded 2414 alignments encompassing a total of 1.25 Mbp from each species, whereas a threshold of E< 10-20 yielded 2820 alignments encompassing a total of 1.32 Mbp. The percent sequence identity of alignments was very high among presumptive orthologues, ranging from 84–100% at the more stringent E threshold of E< 10-80. 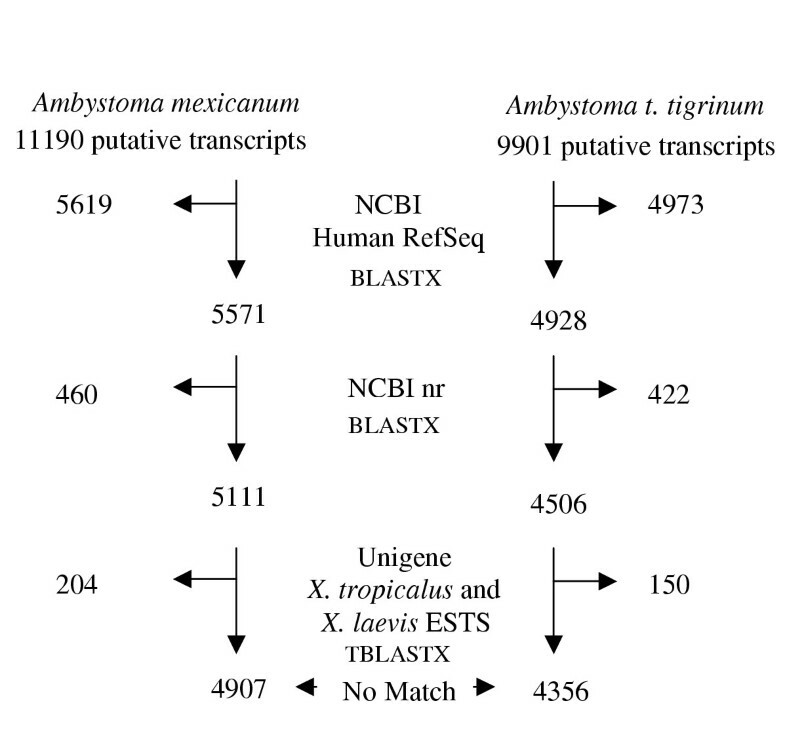 On average, A. mexicanum and A. t. tigrinum transcripts are estimated to be 97% identical at the nucleotide level, including both protein coding and UTR sequence. This estimate for nuclear sequence identity is surprisingly similar to estimates obtained from complete mtDNA reference sequences for these species (96%, unpublished data), and to estimates for partial mtDNA sequence data obtained from multiple natural populations . These results are consistent with the idea that mitochondrial mutation rates are lower in cold versus warm-blooded vertebrates . From a resource perspective, the high level of sequence identity observed between these species suggests that informatics will enable rapidly the development of probes between these and other species of the A. tigrinum complex. Relatively little DNA sequence has been obtained from species that are closely related to commonly used model organisms, and yet, such extensions would greatly facilitate genetic studies of natural phenotypes, population structures, species boundaries, and conservatism and divergence of developmental mechanisms. Like many amphibian species that are threatened by extinction, many of these ambystomatid salamanders are currently in need of population genetic studies to inform conservation and management strategies [e.g. ]. We characterized SNPs from orthologous A. mexicanum and A. t. tigrinum ESTs and extended this information to develop informative molecular markers for a related species, A. ordinarium. Ambystoma ordinarium is a stream dwelling paedomorph endemic to high elevation habitats in central Mexico . This species is particularly interesting from an ecological and evolutionary standpoint because it harbors a high level of intraspecific mitochondrial variation, and as an independently derived stream paedomorph, is unique among the typically pond-breeding tiger salamanders. As a reference of molecular divergence, Ambystoma ordinarium shares approximately 98 and 97% mtDNA sequence identity with A. mexicanum and A. t. tigrinum respectively . To identify informative markers for A. ordinarium, A. mexicanum and A. t. tigrinum EST contigs were aligned to identify orthologous genes with species-specific sequence variations (SNPs or Insertion/Deletions = INDELs). Primer pairs corresponding to 123 ESTs (Table 8) were screened by PCR using a pool of DNA template made from individuals of 10 A. ordinarium populations. Seventy-nine percent (N = 97) of the primer pairs yielded amplification products that were approximately the same size as corresponding A. mexicanum and A. t. tigrinum fragments, using only a single set of PCR conditions. To estimate the frequency of intraspecific DNA sequence polymorphism among this set of DNA marker loci, 43 loci were sequenced using a single individual sampled randomly from each of the 10 populations, which span the geographic range of A. ordinarium. At least one polymorphic site was observed for 20 of the sequenced loci, with the frequency of polymorphisms dependent upon the size of the DNA fragment amplified. 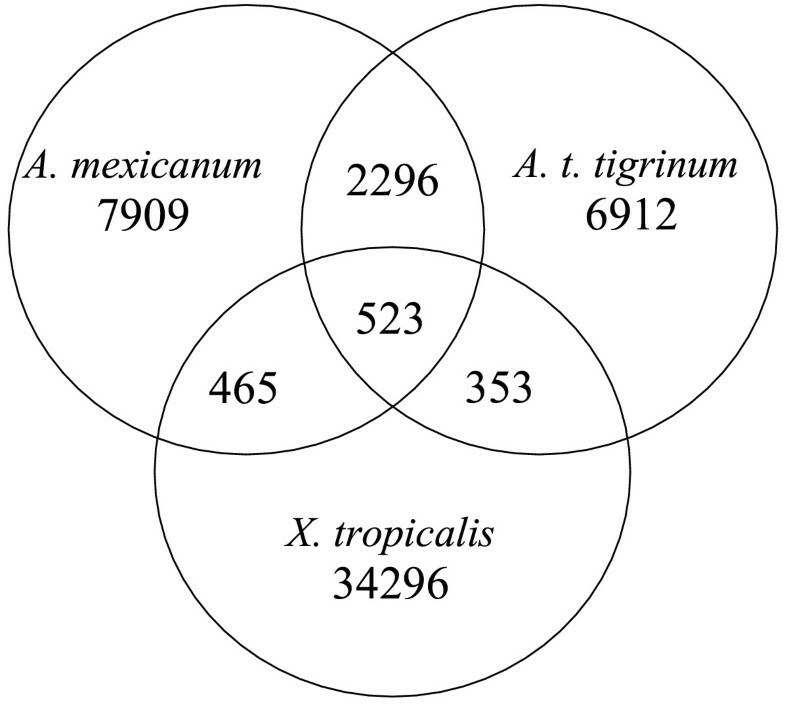 Our results suggest that the vast majority of primer sets designed for A. mexicanum / A. t. tigrinum EST orthologues can be used to amplify the corresponding sequence in a related A. tigrinum complex species, and for small DNA fragments in the range of 150–500 bp, approximately half are expected to have informative polymorphisms. Salamanders occupy a pivotal phylogenetic position for reconstructing the ancestral tetrapod genome structure and for providing perspective on the extremely derived anuran Xenopus (37) that is currently providing the bulk of amphibian genome information. Here we show the utility of ambystomatid ESTs for identifying chromosomal regions that are conserved between salamanders and other vertebrates. A region of conserved synteny that corresponds to human chromosome (Hsa) 17q has been identified in several non-mammalian taxa including reptiles (38) and fishes (39). In a previous study Voss et al. (40) identified a region of conserved synteny between Ambystoma and Hsa 17q that included collagen type 1 alpha 1 (Col1a1), thyroid hormone receptor alpha (Thra), homeo box b13 (Hoxb13), and distal-less 3 (Dlx3) (Figure 4). To evaluate both the technical feasibility of mapping ESTs and the likelihood that presumptive orthologues map to the same synteny group, we searched our assemblies for presumptive Hsa 17 orthologues and then developed a subset of these loci for genetic linkage mapping. Using a joint assembly of A. mexicanum and A. t. tigrinum contigs, 97 Hsa 17 presumptive orthologues were identified. We chose 15 genes from this list and designed PCR primers to amplify a short DNA fragment containing 1 or more presumptive SNPs that were identified in the joint assembly (Table 9). All but two of these genes were mapped, indicating a high probability of mapping success using markers developed from the joint assembly of A. mexicanum and A. t. tigrinum contigs. All 6 ESTs that exhibited 'best hits' to loci within the previously defined human-Ambystoma synteny group did map to this region (Hspc009, Sui1, Krt17, Krt24, Flj13855, and Rpl19). Our results show that BLAST-based definitions of orthology are informative between salamanders and human. All other presumptive Hsa 17 loci mapped to Ambystoma chromosomal regions outside of the previously defined synteny group. It is interesting to note that two of these loci mapped to the same ambystomatid linkage group (Cgi-125, Flj20345), but in human the presumptive orthologues are 50 Mb apart and distantly flank the syntenic loci in Figure 4. Assuming orthology has been assigned correctly for these loci, this suggests a dynamic history for some Hsa 17 orthologues during vertebrate evolution. Comparison of gene order between Ambystoma linkage group 1 and an 11 Mb region of Hsa17 (37.7 Mb to 48.7 Mb). 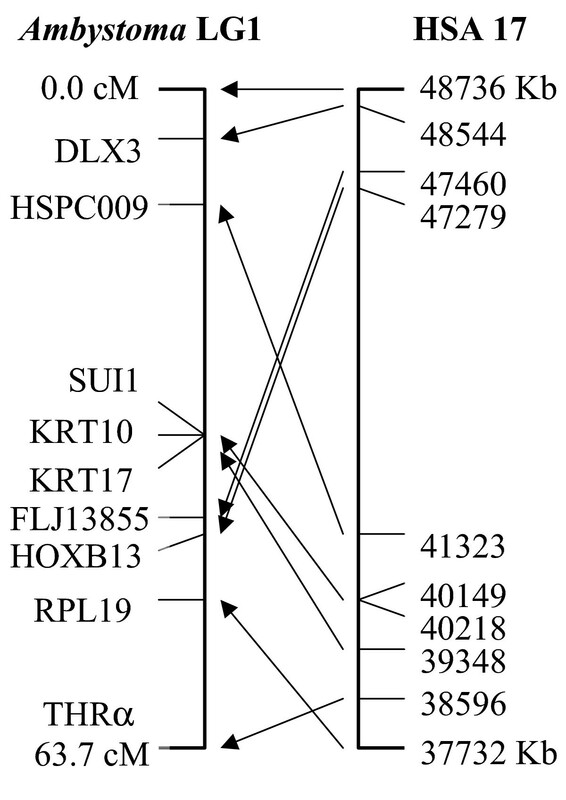 Lines connect the positions of putatively orthologous genes. aSequences are 5' amplification primers, 3' amplification primers, or primer extension probes, and are preceded by F-, R-, and E- respectively. bGenotyping methods are abbreviated: allele specific amplification (ASA), size polymorphism (SP), restriction digestion (RD), primer extension (PE). Diagnostic restriction enzymes and diagnostic extension bases are provided in parentheses. cAmbystoma linkage group ID. "ul" designates markers that are unlinked. dOfficial gene symbols as defined by the Human Genome Organization Gene Nomenclature Committee http://www.gene.ucl.ac.uk/nomenclature/. eBest BLASTX hit (highest e-value) from the human RefSeq database using the contig from which each marker was designed as a query sequence. fHighest E-value statistic obtained by searching contigs, from which EST markers were designed, against the human RefSeq database. Ambystomatid salamanders are classic model organisms that continue to inform biological research in a variety of areas. Their future importance in regenerative biology and metamorphosis will almost certainly escalate as genome resources and other molecular and cellular approaches become widely available. Among the genomic resources currently under development (see ) are a comparative genome map, which will allow mapping of candidate genes, QTL, and comparative anchors for cross-referencing the salamander genome to fully sequenced vertebrate models. In closing, we reiterate a second benefit to resource development in Ambystoma. Genome resources in Ambystoma can be extended to multiple, closely related species to explore the molecular basis of natural, phenotypic variation. Such extensions can better inform our understanding of ambystomatid biodiversity in nature and draw attention to the need for conserving such naturalistic systems. Several paedomorphic species, including A. mexicanum, are on the brink of extinction. We can think of no better investment than one that simultaneously enhances research in all areas of biology and draws attention to the conservation needs of model organisms in their natural habitats. Approximately 40,000 cDNA sequences were isolated from a variety of tissues to develop expressed sequence tags for two model salamander species (A. mexicanum and A. t. tigrinum). An approximately equivalent number of contigs were identified for each species, with 21,091 unique contigs identified overall. The strategy to sequence cDNAs from a diverse collection of tissues from normalized and non-normalized libraries yielded different sets of highly redundant contigs. Only 25% and 28% of the A. mexicanum and A. t. tigrinum contigs, respectively, were identified in common. To demonstrate the utility of these EST resources, we searched databases to identify new probes for regeneration research, characterized intra- and interspecific nucleotide polymorphism, saturated a human/Ambystoma synteny group with marker loci, and extended PCR primer sets designed for A. mexicanum / A. t. tigrinum orthologues to a related tiger salamander species. Over 100 new probes were identified for regeneration research using informatic approaches. With respect to comparative mapping, 13 of 15 EST markers were mapped successfully, and 6 EST markers were mapped to a previously defined synteny group in Ambystoma. These results indicate a high probability of mapping success using EST markers developed from the joint assembly of A. mexicanum and A. t. tigrinum contigs. Finally, we found that primer sets designed for A. mexicanum / A. t. tigrinum EST orthologues can be used to amplify the corresponding sequence in a related A. tigrinum complex species. Overall, the EST resources reported here will enable a diversity of new research areas using ambystomatid salamanders. Ten cDNA libraries were constructed for the project using various larval tissues of A. mexicanum and A. t. tigrinum (Table 1). Larval A. mexicanum were obtained from adult animals whose ancestry traces back to the Axolotl Colony . Larval A. t. tigrinum were obtained from Charles Sullivan Corp. The GARD and MATH A. mexicanum limb regeneration libraries were constructed using regenerating forelimb mesenchyme. Total RNAs were collected from anterior and posterior limbs amputated at the mid-stylopod level on 15 cm animals, and from the resulting regenerates at 12 h, 2 days, 5 days and early bud stages. One hundred μg fractions of each were pooled together and polyA-selected to yield 5 μg that was utilized for directional library construction (Lambda Zap, Stratagene). The V1 (A. mex), V2 (A. tig), V4-5 (A. tig), and V6-7 (A. mex) libraries were made from an assortment of larval tissues (see Table 1) using the SMART cDNA cloning kits (Clontech). Total RNAs were isolated and reverse transcribed to yield cDNAs that were amplified by long distance PCR and subsequently cloned into pTriplEX. The V3 and AG libraries were constructed by commercial companies (BioS&T and Agencourt, respectively). cDNA inserts were mass excised as phagemids, picked into microtitre plates, grown overnight in LB broth, and then diluted (1/20) to spike PCR reactions: (94°C for 2 min; then 30 cycles at 94°C for 45 sec, 58°C for 45°sec, and 72°C for 7 min). All successful amplifications with inserts larger than ~500 bp were sequenced (ABI Big Dye or Amersham Dye terminator chemistry and 5' universal primer). Sequencing and clean-up reactions was carried out according to manufacturers' protocols. ESTs were deposited into NCBI database under accession numbers BI817205-BI818091 and CN033008-CN045937 and CN045944-CN069430. The PHRED base-calling program  was used to generate sequence and quality scores from trace files. PHRED files were then quality clipped and vector/contaminant screened. An in-house program called QUALSCREEN was used to quality clip the ends of sequence traces. Starting at the ends of sequence traces, this program uses a 20 bp sliding window to identify a continuous run of bases that has an average PHRED quality score of 15. Mitochondrial DNA sequences were identified by searching all ESTs against the complete mtDNA genome sequence of A. mexicanum (AJ584639). Finally, all sequences less than 100 bp were removed. The average length of the resulting ESTs was 629 bp. The resulting high quality ESTs were clustered initially using PaCE  on the U.K. HP Superdome computer. Multi-sequence clusters were used as input sequence sets for assembly using CAP3  with an 85% sequence similarity threshold. Clusters comprising single ESTs were assembled again using CAP3 with an 80% sequence similarity threshold to identify multi-EST contigs that were missed during the initial analysis. This procedure identified 550 additional contigs comprising 1150 ESTs. All contigs and singletons were searched against the human RefSeq database (Oct. 2003 release) using BLASTX. The subset of sequences that yielded no BLAST hit was searched against the non-redundant protein sequence database (Feb. 2004) using BLASTX. The remaining subset of sequences that yielded no BLAST hit was searched against Xenopus laevis and X. tropicalis UNIGENE ESTs (Mar. 2004) using TBLASTX. Zebrafish ESTs were downloaded from UNIGENE ESTs (May 2004). BLAST searches were done with an E-value threshold of E <10-7 unless specified. All low quality base calls within contigs were masked using a PHRED base quality threshold of 16. To identify polymorphisms for linkage mapping, contigs from A. mexicanum and A. t. tigrinum assemblies were joined into a single assembly using CAP3 and the following criteria: an assembly threshold of 12 bp to identify initial matches, a minimum 100 bp match length, and 85% sequence identity. To identify putatively orthologous genes from A. mexicanum and A. t. tigrinum assemblies, and generate an estimate of gene sequence divergence, assemblies were compared using BLASTN with a threshold of E <10-20. Following BLAST, alignments were filtered to obtain reciprocal best BLAST hits. Polymorphic DNA marker loci were identified by locating single nucleotide polymorphisms (SNPs) in the joint A. mexicanum and A. t. tigrinum assembly. Polymerase chain reaction (PCR) primers were designed using Primer 3  to amplify 100 – 500 bp SNP-containing fragments from 123 different protein-coding loci (Table 8). DNA was isolated from salamander tail clips using SDS, RNAse and proteinase K treatment, followed by phenol-chloroform extraction. Fragments were amplified using 150 ng DNA, 75 ng each primer, 1.5 mM MgCl2, 0.25 U Taq, and a 3-step profile (94°C for 4 min; 33 cycles of 94°C for 45 s, 60°C for 45 s, 72°C for 30 s; and 72°C for 7 min). DNA fragments were purified and sequenced using ABI Big Dye or Amersham Dye terminator chemistry. Single nucleotide polymorphisms were identified by eye from sequence alignments. Putative salamander orthologues of genes on human chromosome 17 (Hsa 17) were identified by comparing the joint A. mexicanum and A. t. tigrinum assembly to sequences from the human RefSeq (NCBI) protein database, using BLASTX at threshold E< 10-7. Linkage distance and arrangement among markers was estimated using MapManager QTXb19 software  and the Kosambi mapping function at a threshold of p = 0.001. All markers were mapped using DNA from a previously described meiotic mapping panel . All PCR primers and primer extension probes were designed using Primer 3  and Array Designer2 (Premier Biosoft) software. Species-specific polymorphisms were assayed by allele specific amplification, restriction digestion, or primer extension, using the reagent and PCR conditions described above. Primer extension markers were genotyped using the AcycloPrime-FP SNP detection assay (Perkin Elmer). See Table 9 for amplification and extension primer sequences, and information about genotyping methodology. SP and DK: bioinformatics; JW: clone management and sequencing in support of A. mexicanum and A. t. tigrinum ESTs; JS: comparative mapping and polymorphism estimation; DW: extending ESTs to A. ordinarium; JM, KK, AS, NM: PCR and gel electrophoresis; BH and ET: cDNA library construction and sequencing for spinal cord regeneration ESTs; MR, SB, DG: cDNA library construction and clone management for limb regeneration ESTs; DP and SV conceived of the project and participated in its design and coordination. All authors read and approved the final manuscript. Srikrishna Putta, Jeramiah J Smith, John A Walker contributed equally to this work. We thank the Axolotl Colony. We thank Greg Chinchar and Betty Davidson for providing RNA to make cDNA libraries V3 and V4. We acknowledge the support of the National Science Foundation, the National Center for Research Resources at the National Institutes of Health, the Kentucky Spinal Cord and Head Injury Research Trust, and the NSF EPSCOR initiative in Functional Genomics at University of Kentucky.